WEST PALM BEACH, Florida (CNN) - President Donald Trump said Friday there will be no deal to protect hundreds of thousands of young undocumented immigrants from deportation without funding to build a wall along the US-Mexico border. "The Democrats have been told, and fully understand, that there can be no DACA without the desperately needed WALL at the Southern Border and an END to the horrible Chain Migration & ridiculous Lottery System of Immigration etc," Trump tweeted. "We must protect our Country at all cost!" Has Trump's approval rating caught up to Obama's? Trump's declaration casts doubt over how Democrats and Republicans will come together to protect Deferred Action for Childhood Arrivals (DACA) participants -- of which there are nearly 800,000 who were brought to the United States illegal as children -- from deportation because it is unlikely that Democrats will agree to substantial funding for Trump's border wall in exchange for DACA protections. Drew Hammill, House Minority Leader Nancy Pelosi's spokesman, responded to Trump's tweet by stating Democrats are "not going to negotiate through the press and look forward to a serious negotiation at Wednesday's meeting when we come back." Pelosi, Senate Minority Leader Chuck Schumer, House Speaker Paul Ryan, Senate Majority Leader Mitch McConnell and White House chief of staff John Kelly will meet on Wednesday, according to two sources familiar with the meeting. The top discussion topic will be renewed government spending talks, the sources said. Trump campaigned for president on a hardline immigration platform. 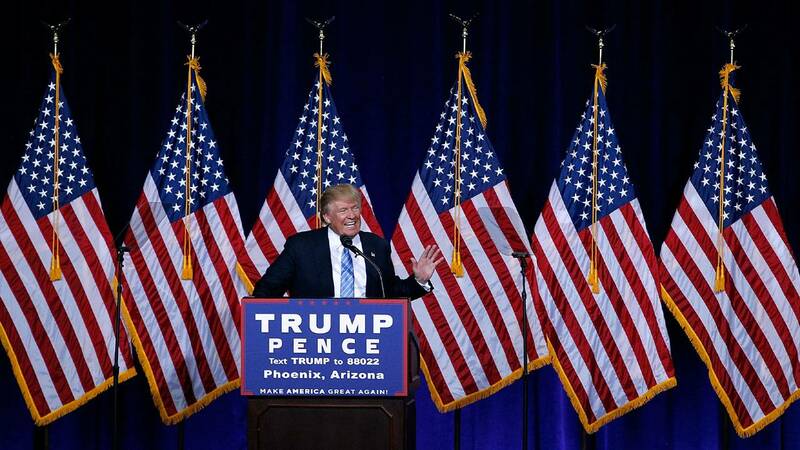 Chants of "Build The Wall" became a trademark of his campaign and, as president, Trump has advocated ending so-called chain migration, guidelines that allow people in the United States to bring in family members from abroad, and the visa lottery system, a program that distributes around 50,000 visas to countries where there is a low rate of immigration to the US. Trump's tweet is his clearest statement to date on his negotiating position with Democrats to achieve a deal on DACA, an Obama-era program that Trump ended in September. At the time, the President said he wanted Congress to step in to save the program. Democrats and Republicans were unable to come together before the end of the year to mint a deal on the immigration program, but members of both parties will return to Washington in 2018 with the DACA program as a focus. Any agreement would be the second major deal between Trump and Schumer and Pelosi -- who Trump has taken to referring to as "Chuck and Nancy." The trio, much to the chagrin of conservatives, worked together earlier this year to strike a deal on the debt ceiling and government spending. Trump has previously said that McConnell and Ryan are on board with a deal to make the DACA program permanent. The details, however, are what matter in the deal and remain elusive. Trump has demanded that funding for the border wall would need to be part of any deal, but it's unclear how far he would be willing to go to protect DACA recipients. Trump said earlier this year that his administration was not looking at "citizenship" or "amnesty" but that they are "looking at allowing people to stay here." He added: "If we don't have the wall, we are doing nothing," but later added that the wall could come later. McConnell said earlier this month that the Senate will hold a vote on immigration legislation in January, but only if Republican and Democratic lawmakers can reach a deal. "If negotiators reach an agreement on these matters by the end of January, I will bring it to the Senate floor for a free-standing vote," he said. Arizona Republican Sen. Jeff Flake had said earlier his month that he received a commitment for a vote on immigration after he voted to pass the Republican tax bill.